Each year Europe's premier chefs gather in Alta Badia, a popular ski destination in South Tyrol, for the Chef's Cup charity race. January 2011 marked the sixth year of this giant slalom event. Founded by the two-Michelin-Star chef, Norbert Niederkofler, the race attracts more than 100 chefs and winemakers each year. The Chef's Cup is not only a fun giant slalom, it's a big charity event with fine food and a gala dinner, which this year supports children in Somalia. Alta Badia in South Tyrol is an alpine valley containing the villages: Corvara, Badia, La Villa, San Cassiano, and Colfosco. The area has made a name for itself as a winter destination for gourmet dining on the slopes and contains the highest concentration of gourmet restaurants in Northern Italy. Sciare con gusto "a taste for skiing" is a popular theme in 12 mountain refuges: 12 top chefs from South Tyrol create their own signature dish, combining local produce with international ingredients, and each is served in a different mountain refuges throughout the winter. Of course skiers in Alta Badia can also get the more commonly served mountain dishes, like pasta, fries, and steaks, but if you've never tried marble trout marinated in Swiss pine grappa, rye bred and juniper butter, crispy brisket in pücia crust sauerkraut and radish salad, pumpkin spätzle (small dumplings) with porcini mushrooms or speck ham and smoked ricotta cheese, then you may want to rethink your mountain dining experience. 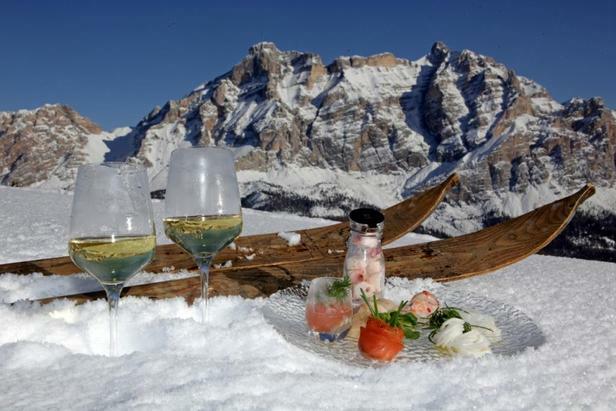 Tourism Director of Alta Badia, Manfred Canins says, "We know that many skiers don't only expect perfectly prepared slopes but extraordinary cuisine as well." Last year the villages of La Villa and Badia invented the Gourmet Skitour Santa Croce. The ski area of Santa Croce is especially suitable for family excursions given the gently sloping sunny pistes. The Gourmet Skitour Santa Croce takes skiers on a panoramic trail through woodland and hamlets. Local gastronomic specialities may be tasted along the way at eight refuges, such as barley-soup with pie-crust, an assortment of dumplings and pastas, grilled or smoked sausages, deer, and ham. Be sure to try chef Erwin Isara's sugared pankcake with raisins which has attracted visitors to the Santa Croce refuge for 50 years. Early birds who can't wait for the first run of the day can hop on a snowcat at 6:50 a.m. and start the day with an energy-packed breakfast at the Col Alt Mountain Hut which serves typical South Tyrolean produce including bread, eggs, speck, milk produces, apple juice, honey, and jam. Then it's onto the slopes to reach the bottom of the valley before the ski lifts open.